Göttingen (German pronunciation: [ˈɡœtɪŋən] listen ; Low German: Chöttingen) is a university city in Lower Saxony, Germany. It is the capital of the district of Göttingen. The River Leine runs through the town. In 2011 the population was 116,052. 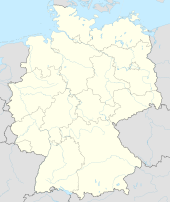 The origins of Göttingen lay in a village called Gutingi, first mentioned in a document in 953 AD. The city was founded northwest of this village, between 1150 and 1200 AD, and adopted its name. In medieval times the city was a member of the Hanseatic League and hence a wealthy town. Today, Göttingen is famous for its old university (Georgia Augusta, or "Georg-August-Universität"), which was founded in 1734 (first classes in 1737) and became the most visited university of Europe. In 1837, seven professors protested against the absolute sovereignty of the kings of Hanover; they lost their offices, but became known as the "Göttingen Seven". Its alumni include some well-known historical figures: the Brothers Grimm, Heinrich Ewald, Wilhelm Eduard Weber and Georg Gervinus. Also, German Chancellors Otto von Bismarck and Gerhard Schröder attended law school at the Göttingen University. Karl Barth held his first professorship here. Some of the most famous mathematicians in history, Carl Friedrich Gauss, Bernhard Riemann and David Hilbert, were professors at Göttingen.